The current building of Basilica San Marco is the third to be built at this Venice location. The first was built in the 9th century to enshrine the body of St Mark but was destroyed by fire. Design and construction of the current basilica began around 1063 and continued over the following centuries. The Basilica San Marco which adjoins Doge's Palace in Piazza San Marco, is crowned with 5 large domes and adorned with elaborate carvings and statues. Basilica San Marco in the Piazza San Marco (San Marco Square), Venice, Veneto, Italy, Europe. 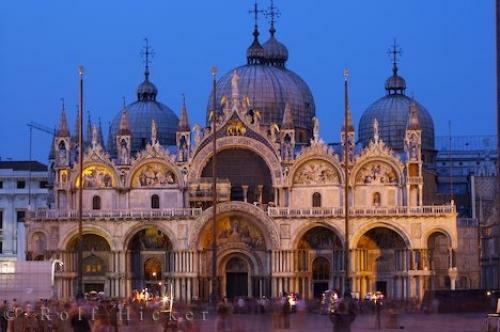 Photo of the famous Basilica of St Mark in the Piazza San Marco, Venice, Italy.